If Richard Nixon had not put it out of its misery on August 15th, 1971, the Bretton Wood system would have celebrated its 70th anniversary on last July 22nd. As Gianni Bulgari put it in Il Corriere della Sera (March 25th, 2014), a single currency like the euro, not supported by a single State, nor by a common political vision, basically amounts to a fixed exchange rate regime. The parable of the Bretton Woods fixed exchange system can therefore give us some interesting lessons on the Eurozone crisis. The nominal anchor of the Bretton Woods system was the US dollar, pegged to gold at the parity of 35$ per ounce, and convertible in gold on request from the participant countries’ central banks. The participant countries declared the gold content of their currencies, and as a consequence the parity of their currencies with respect to the US dollar. The system had five features: 1) the participants committed themselves to restrain the fluctuations of their currencies within a ±1% band with respect to the declared parity; 2) the International Monetary Fund (Imf) was established, with the aim of financing the temporary external imbalances of the member countries, that the exchange rate rigidity was likely to bring about; 3) in case of structural external imbalances the Imf could authorize the deficit countries to realign their central parity with respect to the dollar; 4) at the same time, if a country found itself in a persistent external surplus, the Imf could authorize its trade partners to take protectionist policies against it (e.g., tariffs or quotas); 5) the resident of a country could buy foreign currency only for current account transactions (i.e., in order to pay non-residents for the purchase of goods or services): in other words, international capital movements were restrained. As a matter of fact, the USD became the main instrument of international liquidity, the money used for the settlement of international transactions, taking on the role that had been played by gold up to World War I. One could discuss the way in which this system was implemented, but the differences between its design and that of the euro are striking. In the latter: 1) there are no margins of flexibility; 2) no institution was planned with the role of refinancing the participants’ external imbalances, whose very existence was denied up to the catastrophe (the so-called “stability mechanisms” apply to fiscal imbalances, that according to Vitor Constancio, vice-president of the Ecb, are a consquence, not a cause, of the crisis); 3) national currencies do not exist anymore, which makes it impossible to realign them in case of structural imbalances; 4) surplus countries make the rules (even though since 2011 the “Macroeconomic imbalance procedure” envisages sanctions for excessive surpluses); and 5) capital movement are unchecked. One does not need much more to understand what an incredible act of hubris the euro is, the most rigid monetary system ever conceived. 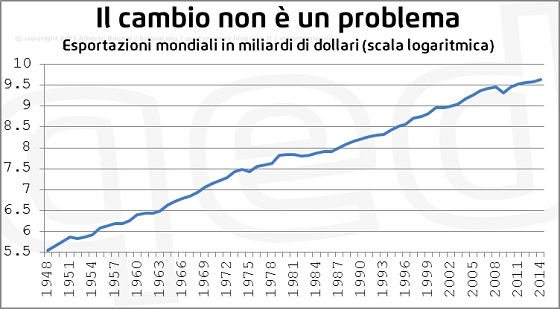 The logical conclusion is that the euro will have a much shorter life than the 27 years of the Bretton Woods system, much in the same way as it is logical for a glass ball to break if it falls on the floor, whereas a plastic ball will not. Rigidity is a virtue only under very specific circumstances. 27 years of life was a noteworthy achievement, if one considers the asymmetry implicit in adopting the currency of a national state as the world currency. This choice exposed the hegemonic country to the dilemma set out by Triffin back in 1960. The US could choose to issue money in proportion with the needs of their domestic economy (and with their gold reserves). In so doing, they would have preserved the credibility of the dollar, but the rest of the world would fall short of liquidity for financing international trade (including the purchase of Us goods and services). On the other hand, the US could issue money in proportion with the world needs. This would allow the rest of the world to buy US goods (the Marshall plan was designed for this purpose), but the tie with the gold would eventually become untenable: the central banks would sooner or later realize that there were too many dollars around, with respect to the US gold reserves, and would knock at Fort Knox’s door to call the US bluff. This is what happened at the beginning of the Seventies, and the answer was given by Nixon on August 15th 1971: the unilateral suspension of the dollar’s convertibility to gold. This suspension did not undermine the role of the dollar, which was still guaranteed by a heavier metal than gold: the plutonium of nuclear weapons. The superpower role of the US kept the dollar in its quality as the world currency, but Triffin’s dilemma still applies today. True, the US keep the “exorbitant privilege” (as Giscard d’Estaing called it) to acquire resources from the rest of the world by simply issuing money. On the other hand, though, the net leakage of dollars out of the country (needed to “grease the wheels” of the world economy), turns into a structural net external indebtedness, because the dollars that go out of the US are invested in US securities. This is the reason why the big world exporters hold a large share of US debt. Naturally when a country is forced to be a net importer of goods and services (in order to work at the same time as the engine and the bank of the world economy) its currency is not entirely credible: a persistent external deficit calls eventually for a devaluation. We are now trapped in an “upside-down” Triffin dilemma, one that Larry Summers defined as “the balance of financial terror”. By stopping their refinancing of US debt, the emerging countries would prevent the US from purchasing their own goods, thereby undermining their own development; by continuing, they expose themselves to the risk of a devaluation of their dollar reserves. There are more lessons to be learned from this situation. The will to overthrow the commanding power of the wicked Yankees is occasionally revealed through the arguments of the single currency supporters: how wonderful it would be to make the euro a reserve currency, in order to print and buy abroad, freeing themselves from the US! But things do not work this way. First of all, can you imagine a Germany-driven Europe, a Europe dominated by a country that for ideological reasons has suppressed its domestic demand for at least seventy years, taking on the role of the US as the engine of the world economy, becoming a net importer of goods (in order to be a net exporter of euros)? Why on Earth would an ECB that is deflationing Europe be willing to reflation the World? What is more a European “nation”, despite 15 centuries of wishful thinking starting with St. Columbanus back in the VII century, will never exist. The sickening and mendacious propaganda about the advantages of the EU are a waste of public money. Moreover, in Europe there are a very few nuclear warheads, those in the hands of France and the UK. As a consequence, these States run their own foreign policies in a completely independent way (Libya is a good case in point). It is therefore extremely unlikely that we will be witness in the next years to the birth of a European state. But without a state, there is no credible currency. This is the reason why Russia, in an effort to free itself from the dollar in order to settle its gas supply to China, did not turn to the euro, but to the currency of a country with which it has shared a common language for centuries and which is endowed with a sizeable arsenal: China. As Luca Fantacci reminds us, China, after the failure of its proposal for a new Bretton Woods conference in 2009, opted for the natural choice for an emerging superpower: imposing its currency on the rest of the world. Something Europe will never be able to do, simply because it is destroying itself in an effort to maintain its monetary abortion: the euro.